An affordable solution for many different applications, the GP6500 is ideal for tailgating, camping, power tool use, and emergency home backup power. The Power to Live. Work. Play. Many get their first introduction to portable generators when they need emergency power. During a power outage, Generac portable generators make sure the most important items—lights, refrigerators and freezers, sump pumps, even space heaters and window air conditioners—are up and running, minimizing any disruption to your lifestyle. Utility power isn’t always available where and when you need to tackle home improvement projects. 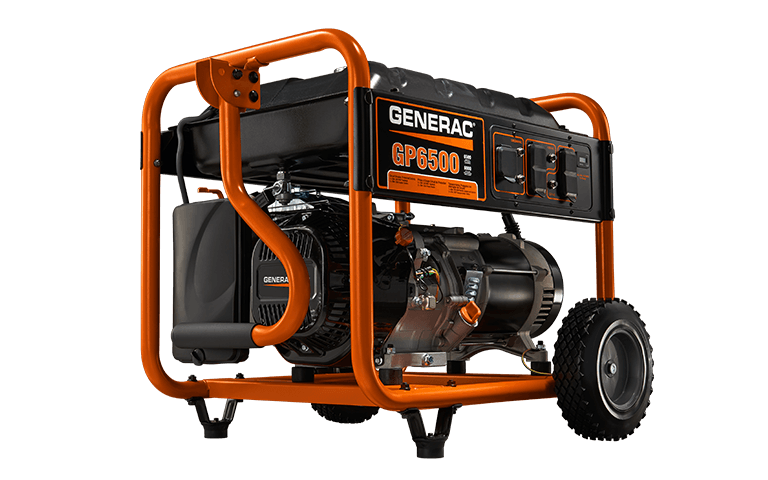 Take a Generac portable generator to that far corner of your property instead of running lengthy extension cords. Or rely upon portable power if you need to turn off utility power for extensive home improvement work. Roughing it is only fun until you can’t make a cup of coffee or charge your cell phone. Bring a Generac portable generator to your next tailgate party or camping trip and you’ll have all the comforts of home wherever you are. Power kitchen appliances. Charge personal electronics. Watch TV or listen to music. Generac portable generators ensure the good times roll. Rated 5 out of 5 by Happy in New Jersey from You get what is advertised I decided that going without electricity and having the basement flood after the last hurricane was more stress than I wanted in my life. I did a lot searching on the internet for a generator that would give me the best peace of mind. I settled on the Generac 5940 GP6500- 6500 Watt Portable Generator (5940). I paid for the tail gate service and it was delivered very promptly and wheeled up to my house. Assembly was extremely easy. I put oil and gas in it as directed, and with one pull it was running. A few weeks later I had the "Transfer Switch" installed and we killed all power to the house, started the generator, and flipped the transfer switch to the operating position. Everything we had connected (which was just about everything except central air conditioning) was powered on. We even ran water until our well pump turned on and the generator never even hesitated or appeared to be under strain. So if we ever lose electricity again, especially for a long duration of time, the neighbors will see that we have heat, water, and lights. They will all be welcome! Thanks Generac for supplying a product that truly is what is advertised. In today's world it is nice to see some honesty in advertising. Rated 5 out of 5 by David from Best " bang for the buck" After researching and using other products, such as Honda. I could not help but know that my GP6500 is the best bang for the buck! I know the dependability of generac having owned one in the past ( used it as an enticement on sale of my previous home). This particular model will also give a surge of power when increase of load is needed . With proper maintenance there is no reason it should not last a very long time. Very comforting to know the dependability of the generac name. Living in Florida having dependable back up power is essential. Sleeping better knowing I now have it! Rated 5 out of 5 by jdirvin1 from Great product My ancient but functional Coleman died 2 days into Florence last fall. I lucked out finding my 6500. I knew nothing of the brand, and paid what I thought was too much. When I hooked it up, however... BOOM, great product and a lit house and fans. Thanks! Rated 1 out of 5 by JKD from Not impressed Bought this unit 2 weeks ago and was fairly simple to put the wheels and handle on. Big disappointment for me is that It would not start right out of the box. Called customer service number to make sure I was doing everything correctly and I was,but still nothing. Had enough fuel and it was turned on, oil in crankcase, on/off switch to on, choke on, but would not even think of firing. Took the plug out to check for spark and no spark. So either the plug is bad or the switch or wires from the switch. This is my first Generator and this is not a good start. Rated 5 out of 5 by BIGE38 from The product has great features - easy to move around easy to fueland maintain We have found that Generac generators and products are well worth the money. They are easy to work on and run great. I would recommend them to anyone. Rated 5 out of 5 by Ryan03 from Needed for immediate concerns that we may need it Having no backup plan for heat and concerns we may lose electricity with forecasted temperatures at -33°. I wanted piece of mind knowing it would sufficiently power our furnace and any other things we need. Started right up on first pull, battery wasn't charged straight out of box when I did initial start, but works now that it has been charged. Great product. Rated 4 out of 5 by Falk from Works great but to much noise Works great but to much noise. only used it for 3 days. Bought because of the storm. GP6500E 49ST is rated 4.7 out of 5 by 276. Maximize your investment and maintain your Generac portable generator with a variety of accessories. Keep your generator emergency ready with scheduled maintenance. Connects to the circuits in your electrical panel that you'll need most during a power outage. Find power cords, plugs, connectors, and other accessories for your portable generator.